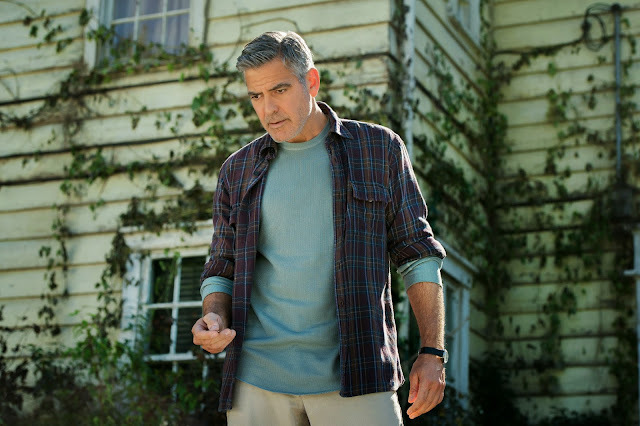 There was the suspicion going into the latest from director Brad Bird (The Incredibles, Mission: Impossible - Ghost Protocol) that Tomorrowland would harbor some core mystery that was too great or too big to be revealed in the marketing and that the secrets it held within its narrative structure would not only set it apart from the onslaught of grim, dystopian tales we've received over the last few years, but bring back the fascination of childhood that was present when we truly experienced something wonderful. After seeing the film, I'm not sure what they were talking about or even trying to hide. I guess I shouldn't necessarily be surprised given the sole screenwriting credit outside of Bird is given to Damon Lindelof (Lost) who enjoys asking questions and letting the audience explore possible answers more than actually supplying solutions himself. That aside, Tomorrowland is not without spectacle and strong ideas. In fact, there is a lot to like about Tomorrowland as the first two-thirds of the film whizz by and build exposition and intrigue in interesting ways. Offering up an intertwining tale of two separated by time, but equally innovative minds the film is an attempt to discuss, while not necessarily plot out, why the world has become such a dark place. By preaching the message it does the film inherently makes any critic who discusses the negative aspects of it feel like a part of the problem it is attempting to address. Smart move by Lindelof, but that doesn't make me feel bad enough about myself to keep me from recognizing the shortcomings of Tomorrowland's third act. Unfortunately, I had somewhat high expectations going in given the minds behind the film were ones I admire and the opportunity to see Bird's fresh, retro-futuristic style in full-on live action was beyond enticing. 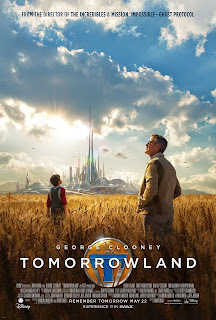 With Tomorrowland though, Bird has crafted his first sub-par film, which is naturally disappointing, but more than that it clearly has so much ambition and so many possible roads to travel that it might have been truly something had the final product lived up to its vision rather than becoming part of the trend it's criticizing. 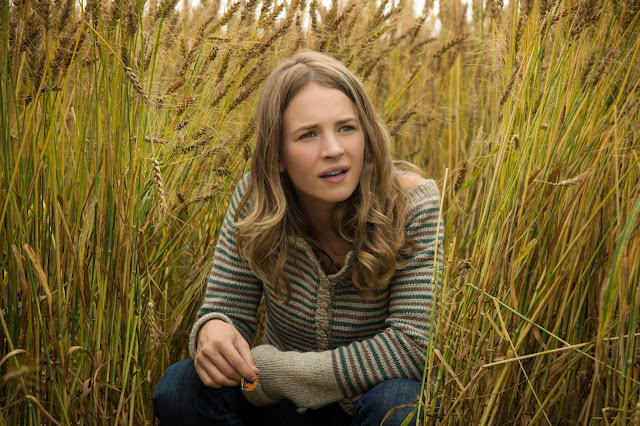 Casey Newton (Britt Robertson) finds a pin that transports her to a magical, futuristic world. It's hard to have ideas, original ideas. I'll give Lindelof and Bird that much at the very least. The film echoes this sentiment by telling its young protagonist and its audience that to give up is to take the easy way out, but that the difficult path is worth the pay out in the end. It even seems to begin preaching the "everyone is special" notion which we should really stop relaying to children of the current culture, but resigns before going too far. Don't get me wrong, Tomorrowland is still very much one of those movies where we are witness to a "chosen one" figuring out their path, but it strays from hitting this aspect too much while making sure you know it's bucking trends in the form of protagonist/parent relationships and the inherent cynicism now present in our society. There is a nice little montage early on in the film in which Casey goes from class to class hearing the same lessons of how we are killing our planet to which she responds with the simple question of, "what can we do to fix it?" It's an inspiring question and it sets the mood for an interesting discussion because in many ways the film is more a lecture about how we, the audience, need to not only begin actively making changes in what we do to take care of our rock, but that it's almost more urgent we have ideas that spring from our emotions and imagination than anything necessarily factual or scientific. Tomorrowland is essentially the utopic result of something along the lines of what Ayn Rand was discussing in her novels that has been labeled as objectivism. The problem with this, whether you accept Rand's ideas or not, is that even the film itself fails to present Tomorrowland as little more than an idea. The reality of it never truly comes into being. Ideas are fine, imagination is great and these can exist separate from reality, but to integrate them means to take in a measure of understanding from both lines of thought-the logical and the fantastical. Tomorrowland, which exists in a state of libertarianism, was always destined to fall given there was no structure or system in place to support it which ultimately results in the antithesis of the ideas and hopes it was originally built on. Frank Walker (George Clooney) regrets ever stumbling upon Tomorrowland as a young inventor. While I think the core idea of what Lindelof and Bird are trying to say is admirable it is their foundation that is not built on a solid rock that causes it to waver in the end. That we as a society like the idea of a bleak future because it requires the least from us today or that hope for the future is essential otherwise it will cease to exist are samples of little nuggets from the sermon that I wished the speaker would have explored further rather than allowing the final act to deteriorate into a standard battle of summer blockbuster obligation. Like I said in the opening paragraph, the first two-thirds of the film are rather thrilling and expertly paced as Lindelof's script works to display how what we collectively believe as a society is due to the perception we're constantly fed and the pessimistic information that is more than readily available while Bird works his magic in bringing momentum to such ponderings by crafting sequences of daring escapes from a booby-trapped house that come together in a cumulative effort that rewrites the history around the Eiffel Tower and launches an antique spaceship out of the Paris monument. That's the thing-there are ideas and imagination here, but because there is no structure to channel it and because there is no definitive epiphany or end game all the early efforts become deflated by a less than stellar conclusion and the sight of Tim McGraw in a moon suit. As I sat, watching the film unfold I was forced to ask myself how much I would have enjoyed this had I experienced it as a ten or eleven year-old. It was hard for me to come up with an answer. As the admittedly beautiful last shot graced the screen and then cut to black I wondered how the film had become so messy so quickly and why the simple idea of creating something purely for the sake of helping people and omitting anything to do with profits or politics wasn't better channeled into the thesis of a film so desperate to be innocent. Maybe it's because Lindelof ultimately knew the truth; that his fantasy land could never be a reality and thus jumbled any clarifying statements rather than accepting the hard truth that dreams are in fact always better.